Cicada Killer wasp sighting: Sphecius hogardii - the less common species. All this week I have been watching 15-20 of these wasps darting and chasing around a metal love seat on my front porch next to a small ornamental garden. I assume they are males - about an inch long, all the same size. Their flight reminds me of dogfighting biplanes in a WWI movie. 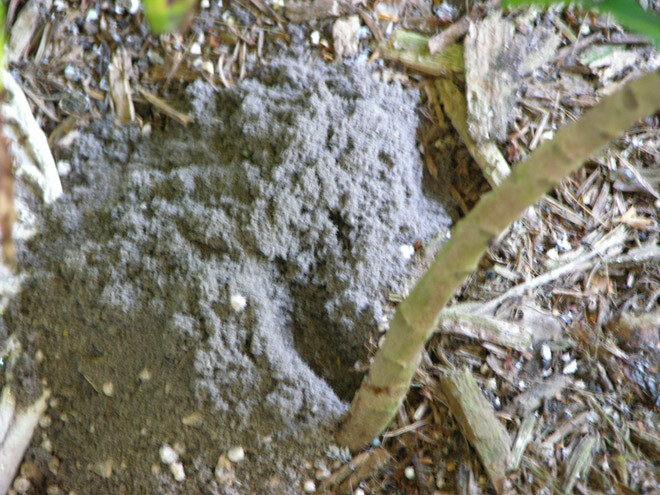 Enclosing some pics of the wasps and one of a burrow (lek) that was dug last night (6/15/11). This is the second summer in a row that I've noticed these wasps on my porch. Found your site while researching on the Internet to try to figure out what kind of wasps they are and whether I should try to eliminate them. Gonna leave 'em alone - they are beneficial. Awesome photos of Sphecius hogardii. 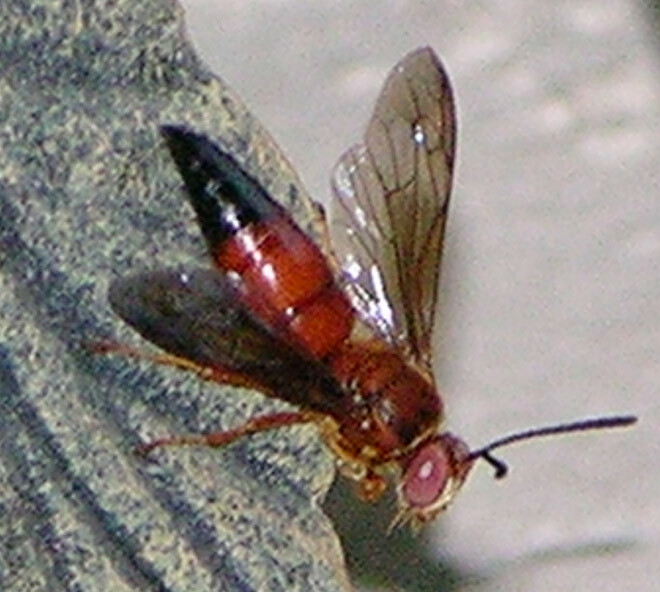 Also known as the Caribbean cicada-killer. Very interesting that you are on Longboat Key. I personally would be interested in knowing the species of cicadas that the females - which will be larger - will capture. If you get industrious. You can shove a stick inside the cicada killer burrow entrance and just wait for the cicada killer to bring in a cicada. When it arrives, it will work on removing the stick. That would be your opportunity to steal the cicada away. I would love to know the species of cicadas that are on Longboat Key. Glad you could use the photos. Sorry I goofed on the burrow photo. Regarding the cicada species, I contacted a biology professor in Pennsylvania who studies cicada killers, and he is coming tomorrow to study the wasps here. He mentioned the stick-in-the-burrow trick, and so I will be back in touch after his visit to share what I can, which will hopefully include the species S. hogardii dines upon. You must be referring to Prof. Chuck Holliday from Lafayette University. Chuck and I go way back. Tell him that Gerry Bunker from Massachusetts Cicadas says "hi." Please keep me informed regarding species. I would suspect Diceroprocta species and perhaps some Tibicens. It is Prof. Holliday. I mentioned your website to him before I read your last comment, and he said "Oh yes, Gerry Bunker and I go way back." Chuck has been here the last two days observing, collecting samples, etc. I told him you said hi. We observed some females but did not catch any with cicadas to feed to their offspring. One new burrow appeared overnight, so the wasps seem to still be pretty active. I caught two snapshots of a female digging more dirt out of an exisiing burrow around midnight last night (6/19/11). 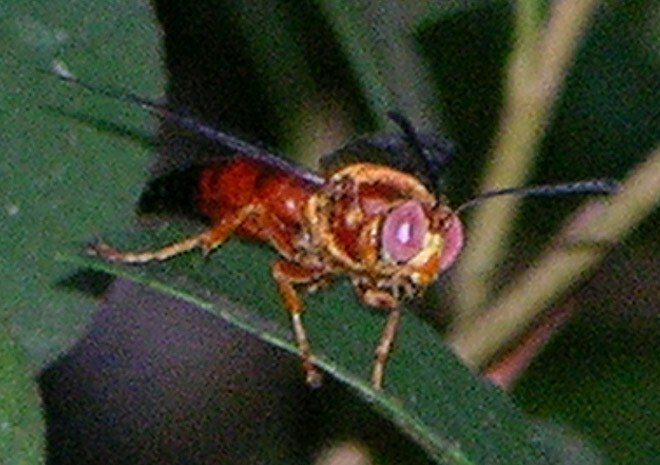 But the types of cicada they hunt remain undocumented at present. I'm going to continue to observe in Chuck's absence, and I may try the stick trick to see if I can obtain a cicada. Thats great. I'm wondering if its still early for the cicada killers. While I'm not as familiar as Prof. Holliday, I am wondering if perhaps the females prepare their burrows prior to mating or afterwards. After all, its still relatively early. Chuck thinks we probably have at least a few more weeks of activity, so you may be right, and we may find more provisioning activity a little later. I'll stay in touch. Thanks for a great, easy-to-use web site, by the way. One more thing - I just finished listening to T.J. Walker's library of Florida cicada songs on the Univ. of Fla. Institute of Food and Agricultural Science (IFAS)web site - http://entnemdept.ufl.edu/walker/buzz/c700fl1.htm. I instantly recognized two songs, both Tibicens - resonans (resonant) and chloromera (swamp). Been thinkng they were tree frogs for the last 5 years! Sorry for the delay in responding. T. resonans is a very large cicada. About the same size as a Tibicen auletes and their calling songs are similar. The Eastern Cicada killer (Sphecius speciosus) has a very hard time with that one but they do take them. Since I have no experience with S. hogardii I would be interested in find out. Hopefully you'll have some luck.